If you want a simple roller door opener for your business, the Topdor Industrial Roller Motor is the right choice for you. It has a minimalistic design and operation yet it is cost-efficient making it one of the most popular options of business owners. This motor has been proven to be very durable. 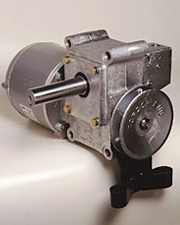 The Topdor drive can perform for long periods while lifting heavy loads. It is a product of years of experience in the gear-cutting and gearbox industry. Call us now at 1300 244 866 to know more about this product.